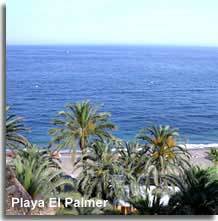 To the west of Almeria City and facing the African continent, the beaches of the Poniente run from Aguadulce to Adra and are located in the municipalities of Enix, Roquetas de Mar, El Ejido, Berja and Adra. 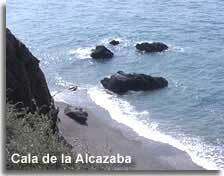 The coastline descends from the Sierra Gador mountain range, behind which is the Alpujarra region of Almeria and the Sierra Nevada. The urban beaches of the Poniente are fully embracing responsible tourism and combining it with an exceptional quality of service. These boundless, clean, well maintained sandy beaches never really get crowded, though they can get quite busy in the month of August when most Spaniards take their summer vacation. Not all of the beaches in the Poniente are urban, there are many natural and rural spaces where tranquillity and isolation can still be found. Living in the Levante beach area I had never felt the need to visit the Poniente beaches, that is until my research for this website, I have to say I was not disappointed. In this page I would like to share my findings and recommendations, starting in Adra and the western most beaches of Almeria. I would say that I found tourism in the Poniente to be typically Spanish, the area is still very traditional and relatively undiscovered by the British market. In a page dedicated to beaches it is impossible to do justice to the towns of the region, these will be covered separately under the towns and villages menu. The farming of fruit and vegetables is the regions largest industry, modern methods of intensive agriculture necessitate a vast number of plastic greenhouses which are a prominent feature of the landscape, they are not particularly attractive and can be a little off putting on a first time visit, let me just say that once you arrive at the resorts and the beaches they will soon be forgotten. The municipality of Adra is home to a marvellous coastline of sandy beaches, rocky coves and clear waters, the town itself, a favoured Spanish resort, has a working fishing port surrounded by shops, cafes and tapas bars, seafood of course being the dish of the day. From the border of Granada in the west, along the quiet coast road to the town centre, there are several rural coves with beaches of dark sand nestled among the cliffs, however, the best beaches in Adra are those closest to the town and are situated either side of the port. The quietest beach, Playa de la Caracola, extends to Playa de Poniente and on to Playa de la Sirena Loca, the main beach area this side of the port. It has a couple of beach bar cafes, shower and wc facilities, and a small play area for children directly on the beach, it continues on to Playa Carboncillo which is situated just before the port. All these beaches, basically each an extension of the other, are of fine sand and pebbles with convenient town parking close by. Playa de San Nicolas, on the opposite side of the port, is the other main beach area, it leads to the quieter Playa Censo around the corner, both beaches are sandy and San Nicolas beach has a play area for children, again parking is in the town centre and very close to the beach areas. Adra is a peaceful holiday resort for those seeking great beaches, relaxation, warm Spanish hospitality and a clean and safe environment for children. The town beaches of Adra take me back to my childhood, when all that for needed for a lovely holiday was sand and sea, somewhere to play and maybe an ice cream or two, my holidays were in the UK and often lacked the sunshine, here well what can I say, the sun shines virtually every day. The Spanish, I have noticed, are very good at enjoying their beaches, if there are no parasols, they take their own, along with sun chairs and tables, sun loungers, lilos, towels, and picnics...I have even seen large gazebos erected offering the whole family protection from the sun. 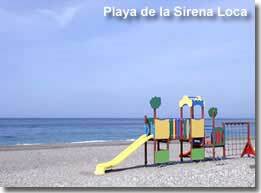 Playa Balanegra is the only beach in the municipality of Berja, long and narrow, its sand and pebbles slope down to the dazzling clean and clear waters. This beach is used mainly by the locals and has few facilities, a sunny Saturday afternoon in June, I found the beach to be practically deserted aside for one or two fishermen dotted along the coastline and several overturned fishing boats, the sea, I must say, was a gorgeous transparent turquoise. 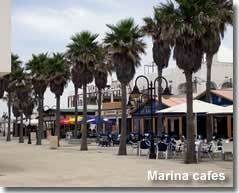 The municipality of El Ejido offers contrasting beach experiences, one the one hand secluded and natural and on the other fully maintained and with plenty of facilities such as the resort of Almerimar. 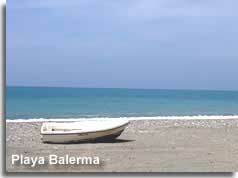 The beaches of Balerma, Piedra del Moro and Guardias Viejas are of a low occupancy, Playa de Balerma has a lovely promenade, the sea is clear and aquamarine in colour, and the mainly sandy beach is dotted with fishing boats. 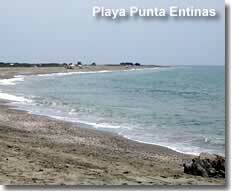 Playa de Piedra del Moro is in a rural location and quite pebbly, popular for fishing, its long length offering plenty of space and isolation. Playa de Guardias Viejas, overlooked by the 18th century castle of the same name, is a rural, mostly sandy beach, frequented by one or two locals looking for quiet seclusion. 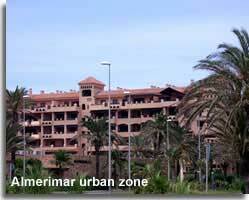 The best beaches for quality, services and facilities in the El Ejido municipality are at Almerimar, a purpose built urban zone and sports resort incorporating the outstanding Almerimar golf course. Building has been limited to a maximum height and the developments provide plenty of green and shady areas, quality hotels and urbanisations offer gymnasium facilities and sports areas for tennis and badminton. Horse riding is available locally and for water sport enthusiasts there is sailing, windsurfing, kitesurfing, and diving. The Victoria lake, situated within the bay of San Miguel and the urban area, signposted Club Remo y Piragismo, offers rowing and canoeing. 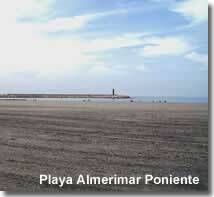 The San Miguel beach of Almerimar runs the full length of the wide sandy bay, separated into two sections by the marina. 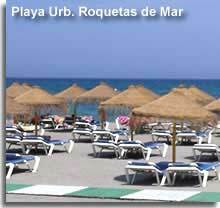 The first, Playa de Almerimar - Poniente, is a well maintained, long and wide beach offering parasols, sun beds, showers, summer lifeguards and plenty of space, with a paseo housing a couple of beach side chiringuitos and parking that is both plentiful and convenient. The Poniente beach ends next to the classy port area where there is a fantastic selection of cafes, bars and restaurants serving everything from ice cream, snacks and tapas to full menus including speciality seafood dishes. Not taking away from the lovely beaches, the port area is definitely somewhere I could spend time, with an enticing setting it provides an appealing spot to sample some local cuisine and round off a day by the sea. 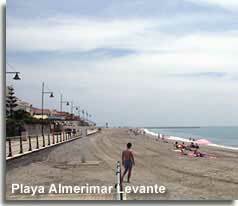 The relatively smaller second beach, Playa de Almerimar - Levante, situated after the port, is also well maintained with shower facilities and a seafront promenade. This is, for me, the prettier of the two beaches, primarily because of the uninhibited outlook over the Mediterranean sea. 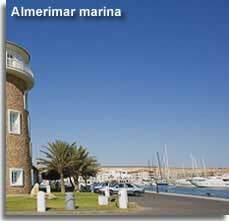 An all round tourist destination and a great place to live, less than an hours drive from Almeria airport, Almerimar has plenty to offer the holiday maker or resident. 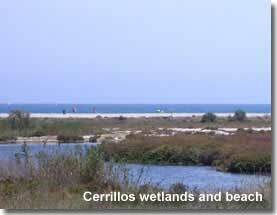 The most remote rural beach areas, not only of El Ejido, but of the whole of the Poniente coast, are the Playa de Punta Entinas and Playa Cerrillos which are located in a coastal zone of environmental protection that stretches for approximately fifteen kilometres from the south eastern limit of the Almerimar urbanisations across to the southern edge of the urbanisations of Roquetas de Mar and includes the whole of the coastline. To my knowledge Playa Cerrillos is actually in the municipality of Roquetas, extending from Playa Serena south of the main resort area, I have detailed the two beaches as one section as they are both within the Entinas-Sabinar protected zone, and together they represent a very special natural beach area. There is no road along this stretch of the shoreline therefore passage from Almerimar to Roquetas and vice versa, by vehicle, is achieved by heading inland, or alternatively, on foot, by walking across the headland via the sandy beaches. 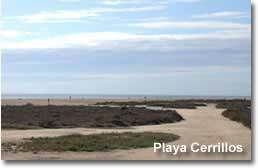 Playa Entinas extends from the beaches of Almerimar and on to Playa Cerrillos, behind the beach area the sand dunes are intermixed with wetland areas of freshwater and saline lakes that also incorporate the reserve of Punta Entinas and the abandoned salt pans of Cerrillo, the marshy habitats attracting large migrations of birds on their travels between Europe and Africa. Not only a paradise for bird watchers the sandy beaches offer an away from it all destination to relax and enjoy the tranquillity of nature in all its beauty. It is worth noting that Playa de Punta Entinas is also a naturist beach, though it is distinctly possible not to meet another soul along this isolated coastline, it is also possible that if other persons are encountered they may well be naked. 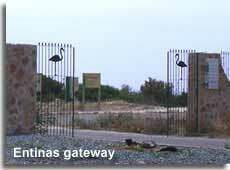 Access to Punta Entinas beach and the Entinas - Sabinar nature reserve is through the gateway located at the end of the Almerimar urban zone and is signposted, there is also a six kilometre signposted walking trail of medium difficultly, Marismas de Punta Entinas, which starts a little further up the main road from the Entinas gateway. I have to admit that I did not walk all the way along the beach from Almerimar to Roquetas, my excuse, I would have had to walk all the way back for my car!!! and it was a fairly hot afternoon. I did however venture a little way, I passed a couple of families relaxing in the afternoon sun, then, not a soul in sight. Access to Playa Cerrillos, if not walking all the way across the headland from Almerimar, is from the southern end of Roquetas de Mar resort at the very end of the urbanised area and Playa Serena, signposted from the end of the seafront promenade. 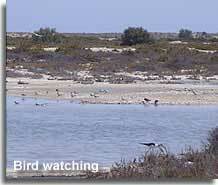 Again, close to the beach, a signposted walking trail can be followed to best enjoy the natural area. 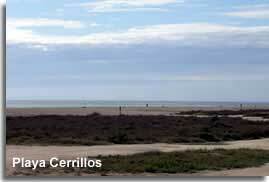 Starting at the Cerrillos gateway which is set back a couple of streets from the end of Playa Serena the six kilometre route traverses the Salinas de Cerrillos. Within minutes of passing through the gates of the Cerrillos natural area, at the start of the walking trail, the bird spotting experience begins, I am no expert but I was in awe to be at such close quarters with the birds, and I even found myself tiptoeing so as not to disturb them. This is a superb destination for nature lovers with very easy access and surprisingly very close to the main resort of Roquetas. There is a reason that certain areas in the world develop into a tourist destination, and the reason here has to be the beaches. The coastline of Roquetas de Mar really is stunning, a gorgeous turquoise sea washes up onto extensive fine sandy beaches, each just a lovely as the next. 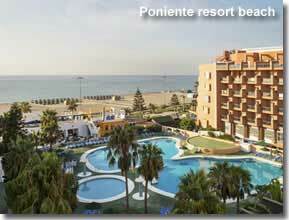 These are without a doubt some of the best beaches on the Poniente, places of luxury for relaxation and enjoyment. A relative new comer to the package holiday market, it is only in recent years that the small fishing village of Roquetas de Mar began its transformation into an impressive tourist destination of the highest caliber, with a smart 18 hole golf course, Club de Golf Playa Serena, and stylish urbanisations of villas, townhouses, and holiday apartments, the resort is also home to an Aquarium, a fantastic shopping centre a water park and karting track. Still traditionally a Spanish holiday spot, there are more and more British tourists discovering this dream location with the airport of Almeria only a forty minute drive away. 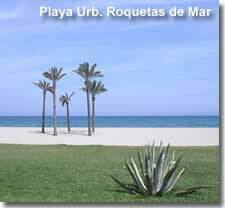 Situated directly in front of the urbanised area of Roquetas, Playa Urb. 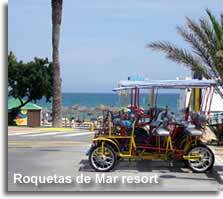 Roquetas de Mar is the main tourist beach and the longest in Roquetas, decorated with palm trees it extends northwards from the silver sands of Playa Serena. Catering for families there are play areas on the beach and plenty of sun beds and parasols which are provided by the chiringuito beach bars, each of them apparently having their own section of beach, which are divided by wide sandy spaces. The beach front promenade, with pretty gardens, cafes and ice cream kiosks, separates the beach from the luxury hotels and apartment complexes. The main streets heading away from the beach are lined with gift shops and a good selection of cafes with shaded outside seating. Parking is plentiful and close to the beaches. Perhaps it is the seemingly limitless stretches of sand, but I was genuinely surprised to find these beaches so uncrowded, especially as I visited in high season and on the weekend. 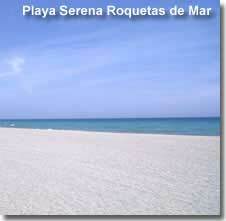 I cannot rate the beaches of Roquetas enough, relative peace in a Spanish holiday resort is unheard of I think. What can I say, only in Almeria. With privileged locations, both sandy beaches, again equipped with play areas for children, run adjacent to the town centre with easy access to the shops, bars and restaurants, and are separated from each other by Roquetas marina. 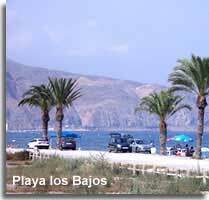 From either beach paseo, on a clear day, it is easily possible to enjoy not only the views of Almeria city but the magnificent headland of the Sierra de Cabo de Gata. 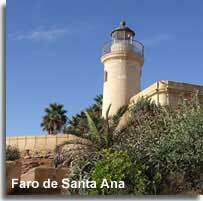 Overlooking the port at the end of the Bajadilla promenade is the Faro de Santa Ana, the old lighthouse was constructed in 1863, it provided navigational maritime guidance until the year 1945 when its ownership was passed to the public company of Andalucian Ports, leading to its eventual restoration which was completed in June 1998. 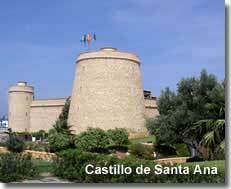 Next to the lighthouse is the restored Roquetas castle, Castillo de Santa Ana, original construction was at the beginning of the 14th century, its principle function was to defend the coast against external invasion. An earthquake in 1804 practically destroyed the castle and it wasn't until December 1997 when its renovation began, being completed in May 2003. An outdoor roman style amphitheatre is situated between the castle and lighthouse, host to open air events and musical concerts. 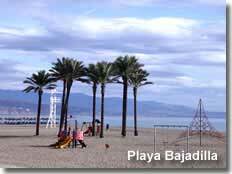 Leaving the town centre behind, the spacious Playa Salinas is named after the area of salt marshes and sand dunes situated behind the beach. Wide and sandy the beach has a paseo, a play area for children and views along the bay to the coastal cliffs of the headland. 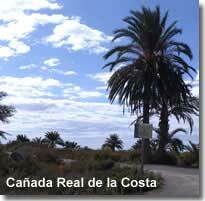 The area is also known as the Puerta Verde de Roquetas del Mar, being the doorway to the rural area of Roquetas, the main attraction on land is the Cañada Real de la Costa, a natural area which includes two separate 1.7 km trails, one for cycling and one for walking, starting at the end of the maritime paseo and running along the coastline to Aguadulce. Off shore is the Arrecife Barrera de Posidonia Natural Monument, a reef of posidonia oceanica, a sea grass which can only be found in the Mediterranean sea, the plant provides an important habitat for an abundance of sea life. Arrecife Barrera de Posidonia, further information provided by the Junta de Andalucia website, in English. 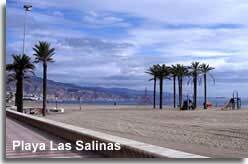 In between Roquetas de Mar and Aguadulce, these two semi rural sandy beaches offer an alternative to the tourist beaches and even though there are no services here, the beaches are very popular with the locals, especially at the weekends. I have said it before and I will say it again, the Spanish certainly know how to enjoy their time at the beach. One Saturday afternoon in June I found myself on the lovely Playa los Bajos, and to my delight I found that this secluded spot was buzzing with life, music was playing, a beach volley ball match was underway, children were splashing in the sea, groups and families were chatting, laughing, eating and drinking under the shade of the palm trees, and the smell of the numerous bbqs sizzling away was enough to make my mouth water. What an amazing atmosphere, this really is how it should be done. 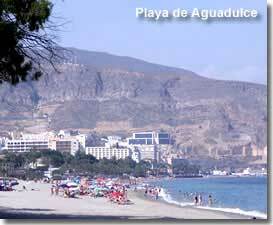 Within the municipality of Roquetas, but a completely separate resort, Aguadulce is probably one of the most well known holiday spots in Almeria, and its beach, probably the most visited. It has an attractive palm tree lined promenade, an idyllic little harbour and a long sandy beach that stretches the full length of the bay, perfect for enjoying the sun and the sea, with fine sand and shallow, calm waters, summer lifeguards, and shower facilities. The town itself has plenty of bars, cafes, restaurants and clubs, a thriving holiday spot for families, couples and singles alike. 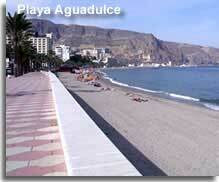 I found this beach to be the busiest of the Poniente, yet I still had no problems parking close to the beach. In the centre of the resort, overlooking the beach is a two floor commercial centre, not one to pass up a spot of shopping, off I went to investigate. The open air centre had a young holiday atmosphere and was packed solid with bars and cafes, all with terrace seating, a lovely place to wind up a day at the beach, the distinct lack of shops was a little disappointing though! 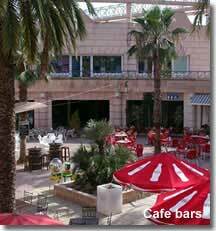 What else was I to do, time for a cool drink and a tapa. Decorated with palm trees, this narrow beach of dark sand and pebbles is situated in a striking location at the base of a rocky cove. 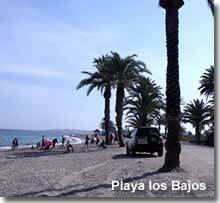 Signposted from the coast road, Carretera de Malaga, that runs around the headland from Aguadulce to Almeria City, Playa del Palmer is the only beach in the municipality of Enix. Mainly frequented by local residents and the guests of the areas exclusive hotels, facilities at the beach include a tennis court and one chiringuito beach bar. There is a scuba diving centre offering courses and diving itineraries from the beach as well as boat excursions to other local diving sites. 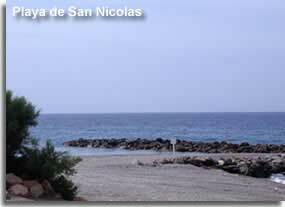 Fishing from the rocks to the side of the beach is a popular past time here as is snorkelling in the clear blue sea. Its hard to believe there is such a vast choice of quality beaches in one stretch of coastline, from unspoilt and rural to spacious family friendly resorts, these are the the Poniente beaches of Almeria.